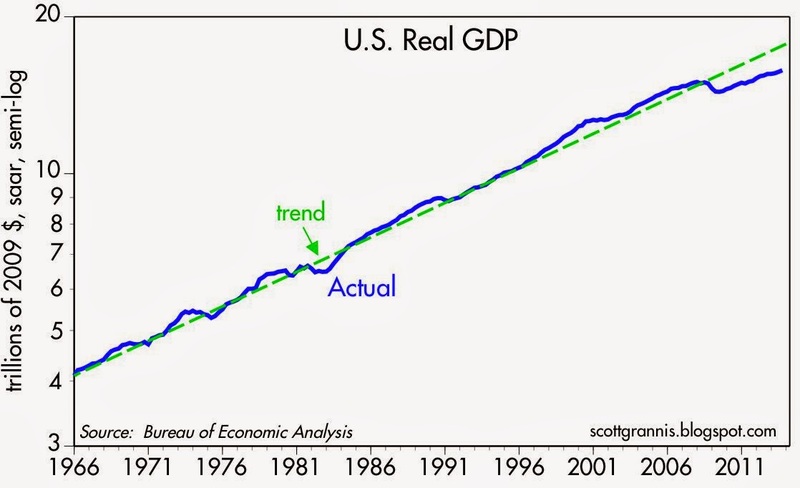 As the chart above shows, this has been the weakest recovery on record. 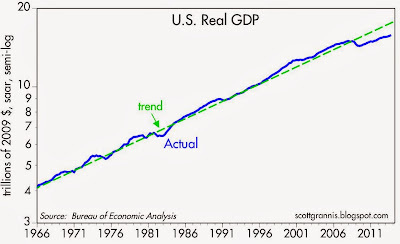 If it had been "normal," the economy would have recovered by now to its long-term growth trend (about 3% per year). Instead, we have a shortfall of about 10%, which is equivalent to lost output and lost income of roughly $1.7 trillion dollars. This is huge, and it needs to be front and center in our national policy debate. Why has the recovery been so weak? The charts above very likely describe at least part of the problem. One reason this has been the weakest recovery ever is that there have never been so many people receiving unemployment insurance compensation for so long. Way more than ever before. 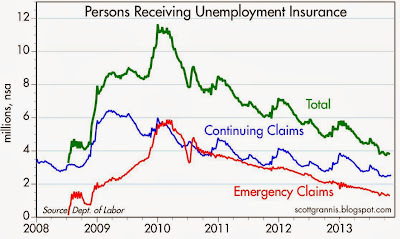 Congress saw fit to create an emergency unemployment insurance compensation program in mid-2008 that by the end of 2009 was covering almost 6 million people. This was an unprecedented display of "generosity" and "compassion" that may have cost the economy something on the order of a trillion dollars. Combine the massive expansion of unemployment benefits with the almost $1 trillion that was squandered on a faux "stimulus" package and you are talking about real money down the drain. With the best of intentions, Congress ended up hurting the very people it was trying to help. The trillion or so that was essentially flushed down the toilet could have created many millions of jobs and higher incomes that would have done wonders for middle class prosperity. If there is a silver lining to this awful cloud, it is that the emergency compensation program is winding down, and now covers only 1.3 million people. The number of people and the percent of the workforce now on the dole is rapidly approaching levels that in the past were considered "normal." There's a decent chance that this will help restore some of the economy's vitality in the next year or two. Millions more people now have a new reason to seek out and accept a job (even if it pays less than they were earning before), and employers now may find that with expected labor costs declining it makes sense to expand their workforce. Unfortunately, the labor market is still oppressed by the uncertainties, added costs and regulatory burdens of ObamaCare, but that may be changing for the better soon. The ObamaCare train wreck in ongoing, and it's highly unlikely the program will survive in anything like its current form for much longer. There is no shortage of pundits declaiming that the stock market is another bubble in the making, but it's not impossible that the market is instead looking across the valley of despair to a brighter future. Scott- Any chance that you can post updated mutual fund flow charts for bond and equity funds? 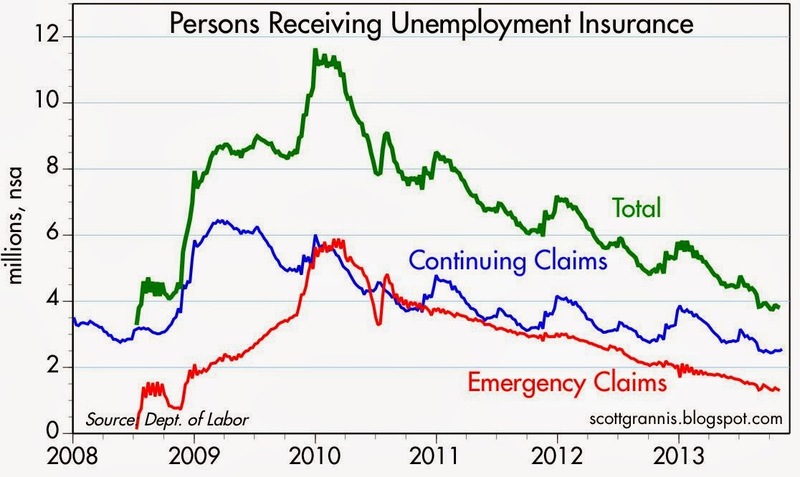 Scott, do you really think expanding UE benefits in the midst of the worst economic downturn since the great depression was really one of the main causes of the weak recovery? Do you have any empirical evidence on this? I don't want an anecdotal evidences of this. 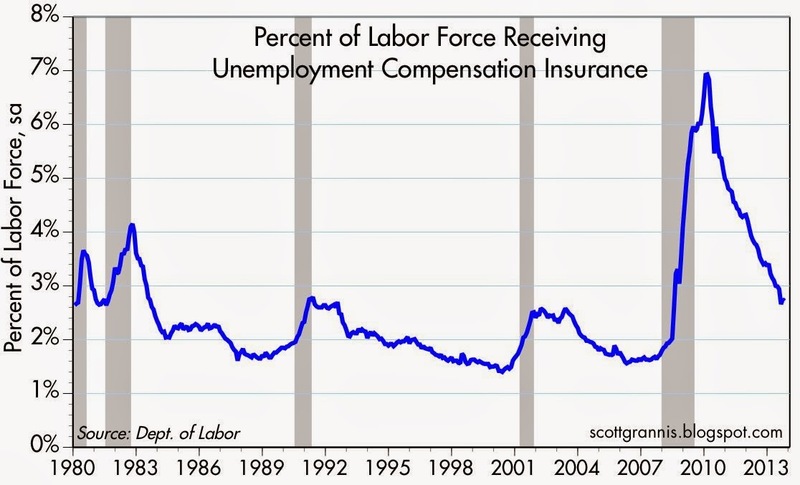 Unemployment insurance benefits as a percent of national income. At its peak, the ratio was slightly worse (slightly better) in the 1973-1974 (1981-1982) recessions but don't let a narrative get in the way of empiricism. Scott - I was hoping the end of this post would contain your counter-factual policy mix. Do you ever read the Modern Monetary Theory people (Mosler)? He was calling for suspension of payroll taxes and a $8/hr job for anyone who wants one (e.g. Civil Conservation Corps-like low wage jobs & training program). 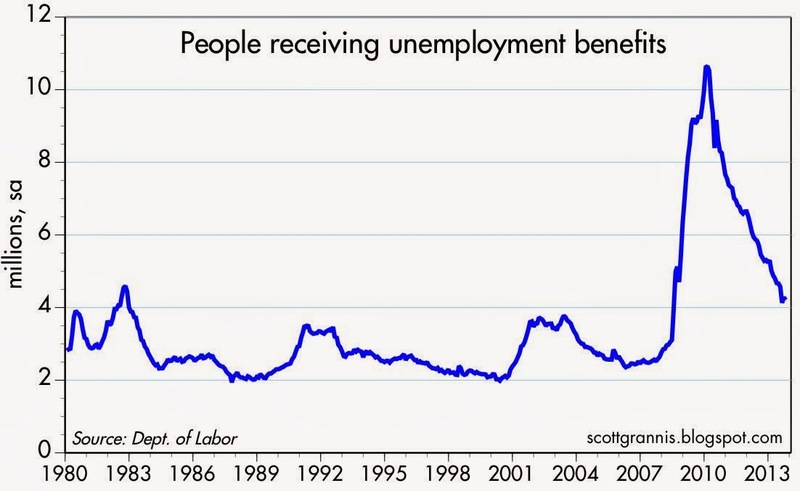 Marmico: I would submit that the number of people (nominally and relative to the workforce) receiving benefits is far more important than the benefits as a percent of national income. 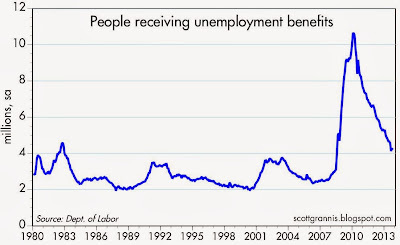 Nudge: I think the policy implications are fairly obvious: don't be over-generous with unemployment benefits and don't use transfer payments or government programs to create the illusion of more jobs. Government should let the economy heal itself. Scott what about the giant transfer payment that was TARP and the AIG bailout? I have to assume you would oppose these as well? I was more curious what you would have done in the crisis and not what you would *not* have done. Nudge: That's a tough one. So many mistakes were made in late 2008, but they were desperate times. There was real fear that global financial markets would collapse. "Do something, anything!" was the overwhelming cry from every quarter. With the benefit of hindsight, it's easy to see that TARP and the AIG bailout were bad decisions. But at the time it was not obvious. If there was anything done that was good in late 2008, it was the Fed's decision to launch QE. Look at the bright side. A few more years of this pathetic "recovery" and it will be time to fit a new trend line which will be flatter in slope, thus making the Obama years look less miserable in the rear view mirror. Well, unemployment benefits, and also SSDI and VA monthly disability checks, probably have hampered workers from returning to the workforce. One-half of vets returning from Iraqistan are successfully claiming disability, and receiving monthly checks. Disability payments are now a major industry: 12 million Americans are getting SSDI or VA monthly disability checks. That said, the downturn was very deep in this recession, with GDP declining at 10 percent annual rate at one point. This was a deep recession--and we were stuck in two wars when it started. Not pretty. Obviously, supply-side action should be taken, and I contend a very aggressive and robust pro-growth monetary policy. I would like to see corporate income taxes eliminated and replaced with gasoline and sales taxes. Looking ahead, I think the worst is behind us, and the DJIA says so too. All-time records are nice news. I think Grannis is right; even with a record, the multiples (pe's) are still ordinary on Wall Street. Property is a little rich but not bubbly. "Generosity" and "compassion" are measured in dollars. Based on the depth and the duration of the 2007 recession, there is no relative difference in UI benefits relative to national income in this cycle. The primary reason this expansion as measured by GDP (dollars) has been weak is below trend PCE. AIG, should have been allowed to fail, after all their "executive" board decided there was extensive profits to be made in the CDS market ..
Marmico: why is PCE below trend? why is PCE below trend? My guess would be debt repayment. Individuals deleveraging, paying down credit card debt, etc. The 30 odd year secular increase in the PCE-GDP ratio and decrease in the personal savings rate are over for the short to medium term. Hardly convincing reasons. Why did those things occur? They are endogenous variables (i.e., they are driven by other things). Perhaps PCE is down in this cycle because so many baby boomers, who drove PCE higher in the 80s and 90s are either retired or retiring and their expenditures are dropping. I think you ignore demographics too much in your analysis of events. I would expect PCE to rise as the baby boomlet generation forms more families and starts spending more. Is the economy worse because consumer spending lower or is consumer spending lower because the economy is sluggish. No family, business, government or country can spend their way to prosperity. We are paying people not to work! Be it UI insurance, direct welfare payments, earned income tax credits, subsidies of all kinds (individual and corporate), Obamacare transfer payments, SSI transfer payments, etc. Dependency on government is the enemy of production and economic growth! We are paying people not to work! Presumably you mean transfer payments to persons. The overwhelming increase in transfer payments to persons over the last 40 years are payments to the elderly (social security and medicare) and to the poor (medicaid). What does that have to do with jobs? This FRED graph is the summation of total transfers less social security, medicare and medicaid. The range is 2.2% to 4.4% of national income. The transfers follow a pattern of rising in recessions and falling in expansions. The 2009 expansion is no exception. Between the $1 Trillion of stimulus and the supposed $638 Million on the ObamaCare website, each man, woman and child in the US could have been given $4 Million and become self insured insofar as medical care in concerned. Tom: that's a worthy thought, but do the math again: you're about 1,000 times too high. marmico, yes I mean transfer payments and yes all that you mention and more (like Earned Income Tax Credit and now Obamacare). The chart you linked specifically excludes them! Of coarse they rise and fall with recessions. But they are GROWING. $2.5 TRILLION of transfer payments and growing. Once Obamacare is included, you can add another trillion! Scott--Steve Fulton here. What's your view of the general level of stock prices? What will affect prices more, an increase in economic activity/hiring or the higher rates that should accompany this?? I think I would say the same thing today, although PE ratios are a bit higher now than they were last August. Stocks are trading somewhere within "fair value" range. I don't see any evidence that there is an equity bubble. Further gains in equities can come from higher multiples and from continued increases in earnings. Higher Treasury yields would undoubtedly accompany continued increases in equity prices, but they shouldn't prove fatal to higher valuations. In a sense, equities are already priced to higher yields. How high is the only question. But fundamentally, a stronger and healthier economy should see higher yields and a stronger equity market.